Yep, it’s as tasty as it sounds! 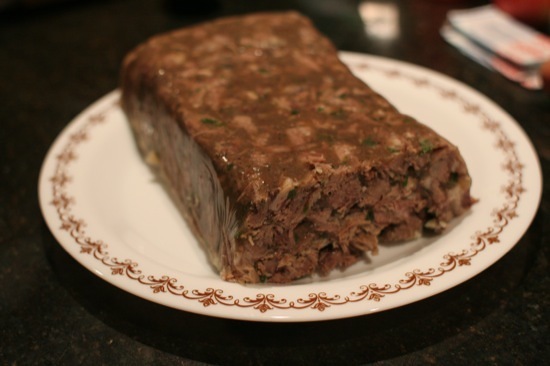 Head cheese (also known as brawn) doesn’t actually contain any cheese – it’s a boiled pig’s head, with the meat removed and chopped up, then set in a terrine mould with jelly made from the cooking broth. I pretty much followed Hugh Fearnley-Whittingstall’s recipe from the River Cottage Cookbook, with a few tweaks based on what I had available. I started with a mirepoix (fancy cheffy sounding word for carrots, onions and celery!) in my biggest cooking pot. I slipped the whole head in, along with the ears (I’ll talk about them in another post), and covered it all with water – it only just fit! Then I added cloves, coriander, nutmeg, peppercorns, thyme, rosemary, parsley and apple cider vinegar. The whole lot then simmers, covered, for 4 or 5 hours. Longer is better, as it extracts more of the gelatine and minerals from the bones (just like a good bone stock). Next step was to remove the head and let it cool. While waiting for that, I turned up the stove and left the lid off the pot. You need to reduce the stock by about two-thirds. Once the head was cool enough to handle, I removed all the meaty bits, diced them up and put them in a bowl. I gave the snout to the dog, and the chickens got the skin and all the fatty, gristly, unpalatable bits (they especially loved the eyeballs!). I was surprised at how much meat came off the head, especially since the cheeks had been removed (for making guanciale). Once the stock had reduced, I mixed a handful of chopped fresh parsley and more apple cider vinegar through the meat and set it out into a loaf tin (why don’t I have any terrine moulds?!). 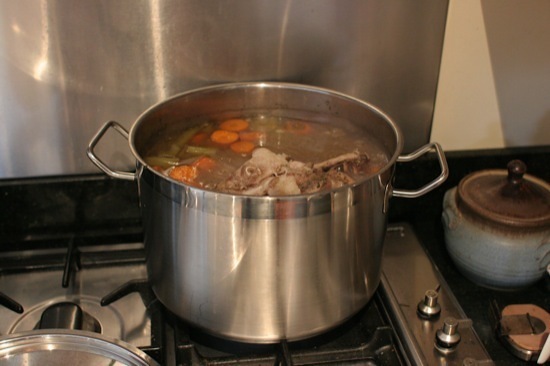 I then poured the stock over the top until the meat was just covered, and put the tin in the fridge to cool and set. I had a fair bit of stock left over, so I poured it into silicone muffin trays and put it in the freezer. Once it’s all frozen, you can tip it out and put it in the one bag. It’ll be easy to separate, and a single “puck” can be added to almost any dish to enrich it – a lot like Fergus Henderson’s trotter gear (which I’m also going to be making soon). It adds gelatinous body and porky goodness, really lifting dishes like risotto, stews, meat pies, etc. Once set, the head cheese is turned out of the mould and can be stored in the fridge for up to two weeks. As I said before, I was surprised at how much this recipe made – the block below must have been well over 2 kg (that’s a large dinner plate it’s sitting on, and I’ve already eaten some!). I had some on toast for lunch today, and will be giving some to my dad and some friends tomorrow. I’ve got another head in the freezer, and will definitely be making head cheese again. I’ll be using more of the herbs and spices next time, and maybe some bay leaves as well. You think you have enough flavour in there, but since you eat it chilled the flavours are more muted and it can really take a lot more than I gave it. I’ll also be seasoning the meat with salt and pepper more before it goes into the mould. If you want to read more about cooking with under-used animal parts, I really recommend Chichi Wang’s The Nasty Bits series over at Serious Eats – I got a lot of good information from her Pig’s Head article. Do you cook with offal and/or offcuts? What’s the tastiest dish you’ve made? @Inner Pickle: Hope you enjoy the sample I dropped off :-). The head was kinda gross coming out of the pot, but once you start deconstructing it looking for the meat, it was a pretty interesting anatomy lesson. Do you know how relieved I am to hear that head cheese is not cheese?!? It sounded like the grossest thing ever, yet something I would have to overcome eventually to be a true snout to tail aficionado. Your attempt sounds altogether lovely. @Meryl: Yeah, “head cheese” conjures up gross images! I’ve no idea why they call it that – it certainly wouldn’t have been invented by a marketing department! Now that we’ve done the snout and the toes (trotters), the tail is the last extremity left to tackle. My mum would love me to make this….but pickled tongue is the best she’s getting for now…lol. Where would one get a pigs head if you don’t raise pigs yourself? Well done with all that work. I love that your sharing some with your dad. @Narelle: I was thinking of your recent experiments with offal while I was writing this! My Dad likes brawn, but I don’t think there’s any way I could get my Mum to try it. I’ve seen halved pigs heads in butchers before, although not often. I’m sure they could order one in for you if you asked. I LOVE head cheese. I mean it. I grew up outside of Pennsylvania Dutch country and head cheese and scrapple are favorite foods in the region. I really enjoyed your lesson on how to make it! @Joanna: I had to Google “scrapple”. It sounds interesting! Just saw pig heads for $5.00 at the butcher. I think I might just summon up the courage to try, but will measure my pot first, and the head. Nothing worse than an excess pig head lying around I’m sure. Would freak out the kids. @Meryl: Go for it! You could probably get the butcher to cut it in half, or even quarters. Did they still have the cheeks on for $5 – that’d be a bargain! I’ve got a weird mental image of you going into a store and asking for help finding a pot big enough for a whole head :-). Interesting…. I like the idea of using all of the animal, but sometimes the reality is more difficult (mostly just overcoming the mental rather than the physical). 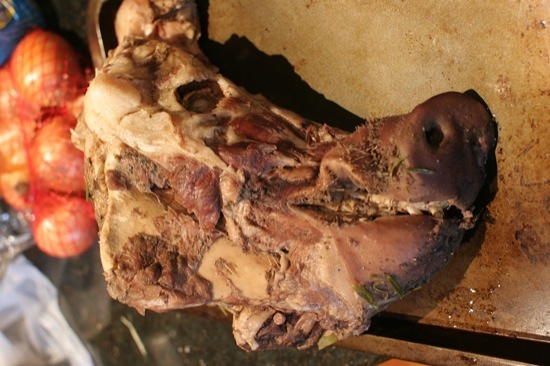 Thanks for sharing your method, I will try it next time we have a pig’s head. @farmer_liz: I agree, it can be difficult to tackle the underused parts of animals. I’ve found it’s only really weird the first time (for each part) – after that, I don’t have any problem the next time. It’s worth it, as offal and scraps can be extremely cheap!